Times, they are a changin’. The environment is changing. The what if’s of the world is changing. We need to think back to harder times and try to recreate the food sources that we can always depend on. Do you know that a LOT of our foodstuffs are imported? And many of them come from China where they don’t seem to care as much as we do about how something was raised. I read a report recently about garlic. It seems that ‘at one time’ most of the garlic we get at the grocery store WAS grown in California. Now MOST of the garlic you find in the store comes from China where their growing practices are less than pristine. Did you know that Chinese garlic is often bleached to cover up spots? That the Chinese garlic can (and probably was) treated with pesticides, toxins and even grown in sewage? Homegrown garlic is very easy to grow. 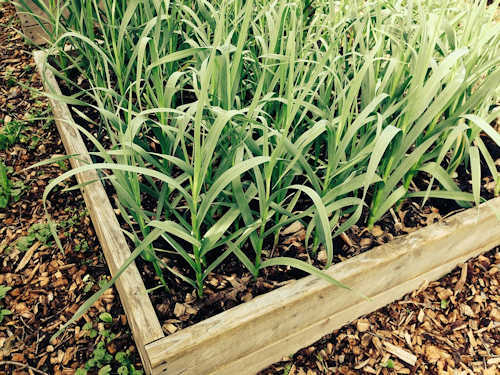 You should start a garlic bed THIS YEAR. It’s springtime. You can find garlic starts at your garden center or farm store. I’m sure garlic isn’t the only food product that’s suspect. You can recreate the Victory Gardens of WW1 & 2 and start to grow your own food. What is survival gardening? It’s akin to the old Victory gardens. It’s food that you grow yourself in your own backyard designed to create enough foodstuffs for you and your family so that you can survive an emergency situation. Why Is A Survival Garden Important? We all have the same basic needs for survival – that is food, water, and shelter. We can live without food for only 3 weeks and we can live without water for only 3 days. Therefore, in addition to storing water and canned/dried food we need to be prepared to feed our families. Victory gardens of old did that. 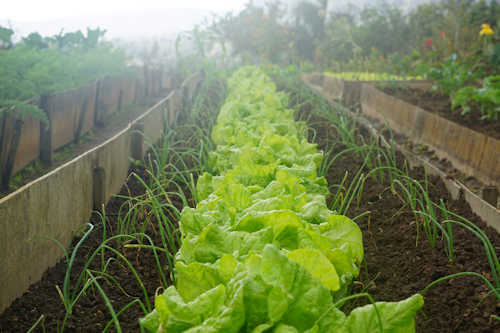 People planted food that their family would eat fresh out of the garden (think salad greens, carrots, tomatoes) as well as foods that could be dried or canned for long term use, even if it’s just to make it until spring. Did you grandparents have a root cellar? Was it filled with rows and rows of home canned goods? Was there a turnip, potato and carrot bin? They thought ahead and so should we. The idea is to increase your preparedness level and along the way you get to feed your family wholesome, nutritious food that you grew in your own garden. Food that you had total control on the methods of growth so that you know you’re feeding your family the best. Most people today are unprepared to meet their family’s food needs for more than a week or two at any given point in time. There’s a reason the stores run out of ‘quick foods’ right before a storm. The unprepared don’t have enough food at home to weather a storm, how will they feed their family in the event of a crisis? All these people rely on the grocery store and sadly imported foods that may have unscrupulous growing practices. Have you walked into your local grocery intending to buy ‘such and such’ and had sticker shock? Grocery prices can fluctuate but they rarely get cheaper. There are fewer farms in America than in the past. Big corporate farms grow huge fields of one single variety of a food when there, thankfully, are many heritage seeds available. What if a disease took out ALL the corn grown in the Midwest? Or all the ‘same variety’ of potatoes grown in Idaho? You can help reduce your family’s reliance on the grocery store. Sure, long term food storage is an option but what would you do when that stash of pinto beans runs out? If you begin a garden now you’ll gain experience. Experience is often the difference between a bare garden and a great one. Start small but start this year. Of course, knowing that you can grow your own is a big relief but growing your own also reduces your overall carbon footprint. You actually save about two pounds of carbon for every pound of food grown at home. Growing your own also greatly reduces your grocery bill. Fresh produce isn’t cheap and there’s nothing finer than a vine ripened tomato just picked off the vine. You can get plant starts this spring at your local nursery or garden center but you can save even more money if you start with seeds. Growing your own food, eating it fresh from the garden, and learning to put that food by through canning or dehydrating is one survival skill everyone should have. Start a garden this year, even if it’s a tomato plant in a bucket on your porch, and you’ll be on your way to a long-term sustainable food source.